DA Form 5447 - also known as the "Officer Service Agreement Selected Reserve Educational Assistance Program (short Title: Montgomery Gi Bill)" - is a United States Military form issued by the Department of the Army. The form - often mistakenly referred to as the DD form 5447 - was last revised on February 1, 2016. Download an up-to-date fillable PDF version of the DA 5447 down below or look it up on the Army Publishing Directorate website. For use of this form, see AR 621-202; the proponent agency is DCS, G-1. National Guard of the United States (ARNGUS), the Department of Veterans Affairs and U.S Army Reserve (USAR). 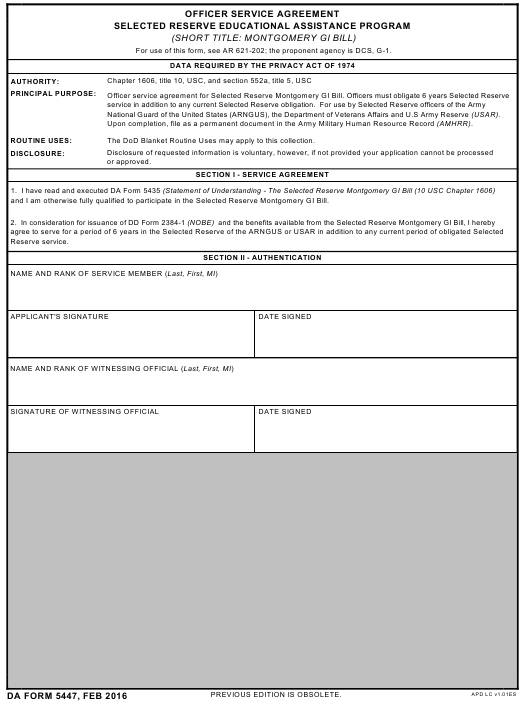 Upon completion, file as a permanent document in the Army Military Human Resource Record (AMHRR). and I am otherwise fully qualified to participate in the Selected Reserve Montgomery GI Bill.